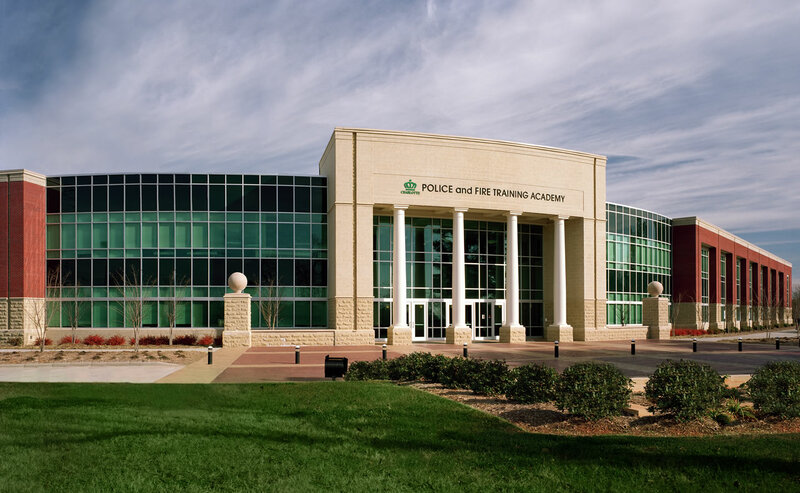 This signature project began with an Advance Planning process that included a comprehensive planning study and master plan for combined training facilities to be used by the Charlotte-Mecklenburg Police Department and the Charlotte Fire Department. In-depth workshops were conducted with representatives of each of the specialties represented in the training operations. The design team defined operations, collected statistical data, identified training trends, and toured existing facilities throughout the United States before developing a master plan and conceptual design for the campus. The two-story Academy Building is divided into separate components for the Police Department, Fire Department, and commonly used spaces such as the Cafeteria and 500-seat Auditorium. Spaces include two Media Centers, Video Production facilities, Administrative Offices, Classrooms, Situational Training Rooms, Lecture Rooms, Computer Labs, Weight Training Rooms, Defensive Tactics Room, Firearms Training Simulator, 911 Training and Backup Operation, Gymnasium and Locker Rooms. The building was selected as the “Best City Building“ by employees of the City of Charlotte.